I came across this small sailing yacht by chance. Does anyone know who designed her and what class of yacht she is? I would say at a guess she’s about 18 feet LOA, and with her bowsprit which I don’t think was an original fitting, she would be 21 feet. I reckon her beam must be approximately 6 feet. 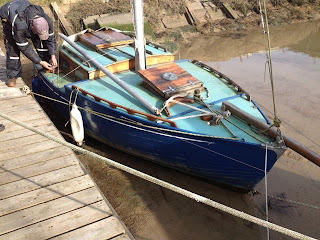 She has a large centreplate and a transom hung lifting rudder. Her draught when the plate is up must be about 1 foot, perhaps 3 foot 6 inches when down. She is for sale and in need of a lot of TLC, but for someone who wants a small classic, shallow draught yacht built in the late 60s she could possibly be brought back to life. The asking price is £350.00, but I think you might get her for free. It is my opinion that whoever buys her will have to fork out at least £3,000 to bring her back to good condition. Reasons for the high cost of renovating her are numerous. She will have to be taken from the yard by road, because she is not in a state for sailing away. That will mean hiring transport or buying a trailer. The craning out will be for free. 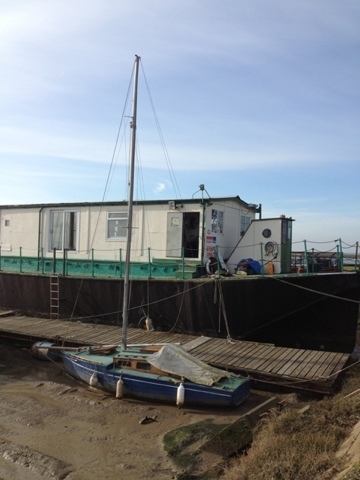 While renovation takes place, ideally she will need to be under cover. Most of the interior will need rebuilding. Some frames may require doubling, and she will have to be re-caulked. Her mast is far too long and it has been extended with a wooden section at the base. Even if her sails are good, they will not fit when the mast has been shortened. Shrouds and stays will have to be shortened. Therefore she will require a new mainsail, and possibly new foresails. Why am I bothering to explain these things? I can’t bear to see a lovely boat deteriorate and die. If there is someone reading this and who is prepared to spend time and money renovating her, I will give you details as to her whereabouts, but I take no responsibility for your decision to buy her. 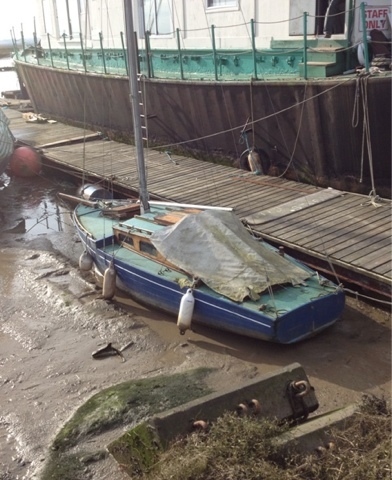 She may have rot in her bilges, in her centreboard case, in her transom and in the forepeak. It’s such a shame to see her die. I cannot afford the money and the time for re-commissioning her, because I have my own little boat ready for sailing this coming spring and throughout the season. This is food for thought. Do you know what class of boat she is?